We’ve touched upon quite a few aspects of observation revolving around Gamma Waves (EEG) & DMT (dimethyltryptamine) in Part 1 and Part 2. It appears as though the commonalities regarding insightful “Aha!” moments, lucid dreaming, Ayahuasca (DMT) experiences, electrically induced lucid dreaming, hypnosis and meditation all appear to be an increased level of relaxation that induces slower brain waves coupled with Gamma EEG waves and potentially an above average level of DMT in one’s system. Based on the basic measurements including but not limited to the positive neuroplastic effects, systemic health benefits of sleep, and positive hormonal secretion… these induced altered mental states appear to work towards optimizing the functioning of the brain and body. Logically speaking it wouldn’t appear to make sense that a person producing elevated amounts of Melatonin, Dopamine, and HGH while actively regenerating would be considered to be in a sub-optimal state. I’d venture to say that these parameters would be much closer to the what health looks like rather than having the opposite parameters (low levels of Melatonin, Dopamine, & HGH, with atrophy of the corpus callosum). We ended the second part with asking the question about the possibilities of creating physical differences in one’s body while in this altered state. We cited the examples of studies showcasing the effectiveness of hypnosis for pain management, anesthesia, hair regeneration, tooth removal, as well as a few others. These all seem rather useful mental tools to have access to. The question is… what else might we be able to access? Dr. Milton Erickson was an American psychologist and psychiatrist who specialized in medical hypnosis and family therapy. He was the founding president of the American Society for Clinical Hypnosis. He was also a member of the American Psychiatric Association, the American Psychological Association, and the American Psychopathological Association. In reading the book, Uncommon Therapy it is evident that Erickson’s approach appears quite unorthodox but intriguingly calculated. While his predominant field of therapy appeared to be alleviating various common forms of behavioral disorders, there are a few noted cases in which “uncommon” occurrences took place. A 20 year old man growing 12 inches in height in one year? It surely sounds improbable but since we’ve already outlined the projected hormonal fluctuations from hypnosis (melatonin-somatostatin-HGH), there appears to be a potential biological foundation in place. The following studies showcase the effectiveness of external HGH administration in increased height: New England Journal of Medicine (1999), British Medical Journal (2002), Journal of Endocrinology Metabolism (2004), and the International Journal of Pediatric Endocrinology (2014). It’s yet another example of what might be considered improbable effects of hypnosis without comprehending the potential underlying, measurable factors. In 1977, in the American Journal of Clinical Hypnosis a study was published by psychologist Dr. Richard D. Willard regarding the potential for hypnosis to induce breast growth in women. “22 female volunteers, ranging in age from 19 to 54, were asked to use self-hypnosis and visual imagery in an attempt to enlarge their breasts. At the start of the study, which was eventually described in full in the American Journal of Clinical Hypnosis, five individual breast measurements were taken for each woman - circumference, height, width and other measurements were recorded by a doctor who was not involved in the experiments. The volunteers then attended Dr Willard’s clinic once a week for six weeks and once every two weeks for an additional six weeks. At the first session the women were taught how to relax their muscles by using the same sort of technique as the one I have already described in this book. Subsequently, they were asked to do this and then to imagine that they had a wet, warm towel draped over their breasts. They were asked to imagine that the towel was making their breasts feel warm, or - if they found this difficult - to imagine that a heat lamp was shining directly onto their breasts. Once the women were satisfied that their breasts were getting warmer, they were asked to develop an awareness of a pulsation within their breast tissue. It was suggested to them that they should become conscious of their heartbeats and feel each new beat pushing blood into their breasts. They were told to practise this exercise every day at home. At the end of the 12-week experiment, 28 per cent of the women had achieved the growth in breast size that they wanted, 85 per cent had confirmed that a significant increase in their breast size had been achieved and 46 per cent had reported that they had had to buy bigger bras. The average increase in breast circumference was 1.37 inches; in breast height, 0.67 inches; and in breast width, 1.01 inches. Most women reported that by the end of the experiment they could feel warm blood flowing into their breasts simply by thinking about their breasts. There were other advantages, too! Those women who had - at the start of the experiment - complained of having breasts of unequal size, reported that their breasts had become equal in size. All the women reported that their breasts were now firmer. And some 63 per cent of the women, who had complained of having pendulous breasts when the experiment had started, reported that the fullness and the contours of their breasts had returned. Incidentally, to make sure that the extra breast size hadn’t just been achieved by an increase in weight, the women were also weighed at the start of the experiment. At the end of the 12-week period 42 per cent of the women had actually had a weight loss of greater than 4 pounds, but had all nevertheless noticed an improvement in their breast size. Adult height growth, adult breast growth? If cancer signifies an abnormal growth of cells and is linked to mental depression, could it be possible to induce desired growth from inducing a completely different type of mental state which optimizes “good” hormones? If children have consistently shown the ability to regenerate their severed fingertips fully while adults cannot… what is the main difference in mental and hormonal levels compared to adults? Could this observation be the potential link between the spontaneous remission of cancer using hypnosis and potentially many other similar altered states? The big difference between hypnosis and the external administration of substances is the measurability factor. In administering a drug or compound, it is usually isolated, measured, and administered orally, transdermally or injected. When it comes to hypnosis, factors such as hypnotizability of the patient (corpus callosum development), expertise of the hypnotherapist, and consistency of application are key variables. The key takeaways from the 1977 study by Dr. Willard is in regards to the consistency of application. It was a 12 week study (84 days) in which daily practice of self-hypnosis was induced by each volunteer. The volunteers would also attend a total of 9 hypnosis sessions by Dr. Willard. In completely unquantified theory… this would equate to 75 total microdoses of HGH (self hypnosis techniques) and 9 full doses of HGH (hypnosis administered by Dr. Willard). A 1998 study in Gynecology Endocrinology showcased the effectiveness of administering a compound to enhance expression of IGF-1 (insulin-like growth factor 1) in order to increase breast size in women. Incidentally melatonin also appears to enhance expression of IGF-1 outlined in Growth Development & Aging in 1990, Experimental and Clinical Endocrinology & Diabetes in 1997, and the Journal of Pineal Research in 2008. In addition, if we are to believe that the nervous system is the basis for communicative function between the brain and body, the relationship between Melatonin and Nerve Growth Factor (NGF) would appear key. If one were to assume that these results of physical enhancement are “real” we would presume that there would be distinct changes in Growth Hormone fluctuations as well as the nerves that transmit the signal(s). Here are a few studies supporting the role of Melatonin (which increases during “meditative-like” states) on NGF: Journal of Pineal Research (1998), Journal of Neuroscience Research (1998), and Neurology and Clinical Neurophysiology (2002). The more you dig into the details… the less far-fetched the results would appear to be. Obviously this is based on extremely crude observation but it is an observation nonetheless. Additional interesting notes from the group of studies is that in the 1974 study, hypnosis by itself had no effect on breast growth. It was only hypnosis with suggestion for breast growth that actually stimulated the positive effect. In the 1977 study by Dr. Willard there was also a correlation between the ease of “visualization of blood flowing into their breasts and the increase in size which they obtained”. These findings would be extremely difficult to quantifiably measure utilizing traditional biological parameters. This is a case of “unexplainable” effects that correlate with intention of the mind. Perhaps they can be measured utilizing a specific frequency of infrared camera or some sort of electrical flow capture device? In Dr. Robert Becker’s book “The Body Electric”, he outlines an experiment in which he simulates the bio-electrical current that salamander’s utilize to regrow their severed limbs. 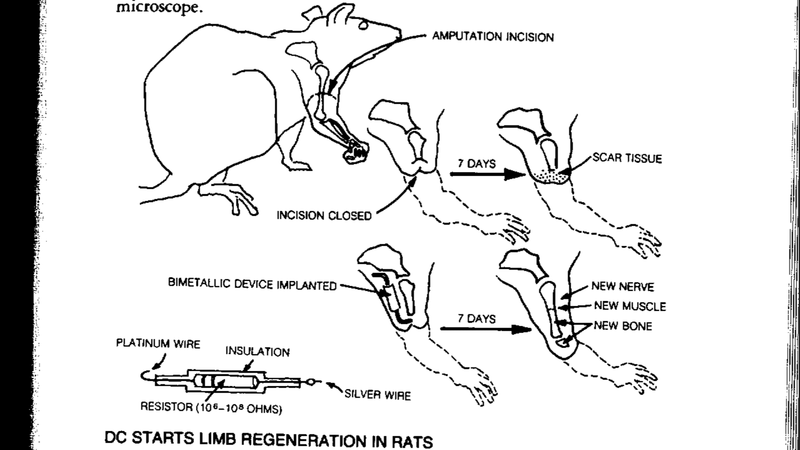 Traditionally speaking, a fully mature rat isn’t capable of regenerating an arm that has been clearly severed past the elbow. However regeneration is exactly what was observed in his experiments in the 1970s and has been replicated recently in a study published in 2015 in the journal Scientific Reports. Could it be possible that the observed changes in DC (direct current) within the brain (“The Body Electric”) during hypnosis could potentially create the precisely altered electrical stimulation for “improbable” growth and regeneration? Perhaps certain electric frequencies are more easily “transferred” via the aspect of visualization than others? But once again… we’re beginning to digress. Let us postulate that all of these abilities are indeed “real” and that we in actuality have untapped powers of the mind when utilizing various techniques to purposely quiet the brain in order to tap into higher Hz levels (Gamma waves) and possibly DMT synthesis. The question then becomes… does it make logical sense to completely discard the information derived from these altered states? For example, during hypnosis… especially somnambulistic states (ultra deep hypnosis), some hypnotherapists have stumbled upon patients that begin to discuss “past lives”. It appears as though this occurs unexpectedly as the hypnotherapist attempts to “regress” the patient to an earlier part of their life that they aren’t able to consciously recall. It appears as though instead of merely delving into early childhood, the patient vividly begins to describe experiences not associated with their current lifetime. It’s a strange phenomena to say the least. This occurred in the case of Yale alumni Dr. Brian Weiss which led to him authoring the book “Many Lives, Many Masters” and subsequent follow up books. A similar phenomena occurred to self-proclaimed atheist Dr. Michael Newton who would go on to author “Journey of Souls” and a few other books. Once again we see these mysterious Gamma waves associated with hypnotizability and even more specifically age regression hypnosis. It’s interesting to note that the following studies have equated Theta-Gamma coupling associated with both short-term and long-term memory recollection: International Journal of Pyschophysiology (2002), Neuroimage (2004), and Technology and Health Care (2015). Could it be that during these deepened states of consciousness, high level gamma waves are induced which allow the person to “recall” information in which the origin is currently unknown? Something like an “ULTRA-Aha!” moment? Q4LT has extensively covered the potential physiological aspect of “reincarnation” recall amongst hypnotized adults as well as children in the piece titled “Statistics of Reincarnation”. We included the work by Dr. Ian Stevenson and Dr. Jim Tucker at the University of Virginia in which over 5,000 documented cases of children seemingly recalling “past lives”. It surfacely appears as though there might be some distinct similarities in terms of EEG state and potentially hormonal release in both hypnotized patients and young children during recall. The concept of reincarnation and “past lives” is rather unscientific by nature. It is not a field of study that can be quantified utilizing traditional scientific means. However, that doesn’t equate to the validity of discarding the concept altogether especially if enhanced abilities are observed that coincide with very similar physiological states during hypnosis. It simply lacks consistency to embrace the anesthetic aspects of hypnosis, accelerated healing of hypnosis, hair regenerating abilities of hypnosis, and the overall physiological benefits of hypnosis only to discard whatever doesn’t fit into one’s measurable “belief systems”. At the same time it doesn’t equate to ingesting the information and taking every word as “gospel” but to discard it completely would appear to be inconsistent which is rather an unscientific quality within itself. We do understand that some of these concepts might make some readers a bit “uncomfortable” as we are beginning to push the boundaries of what we believe about our inherent nature. As the saying goes… growth spurts can tend to be uncomfortable. However, we’ve tried to remain as consistent as possible as it pertains to Gamma waves and the possibilities of endogenous DMT synthesis that correlates with these innate abilities and insights. The discussion continues here in part 4.